When you are studying a problem, it can be very easy to focus on building out a list of facts. But, while facts can be illuminating, they are rarely inspiring. Stories, on the other hand, encapsulate the who’s, what’s and why’s in one memorable narrative. Stories excite the imagination, which leads to having more and better ideas. One storytelling template you can use is Freytag’s Pyramid. Gustav Freytag was a German novelist with a passion for studying five act plays. 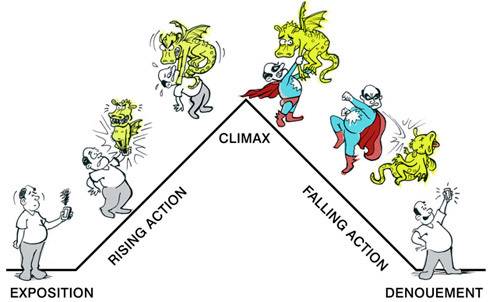 He determined that most stories can be broken into five parts: exposition, rising action, climax, falling action, and dénouement (aka. conclusion). In his article, Storyboarding and UX, author Ben Crothers provides an enlightening illustration of Freytag’s Pyramid applied to a product storyboard. A story of a man and his phone, using Freytag’s Pyramid. Published in UX & Storyboarding by Ben Crothers. Mapping out your product ideas as storyboards forces you to break down the problem and solution into its simplest, base form. It also provides an easy way to share and validate your ideas with other people. 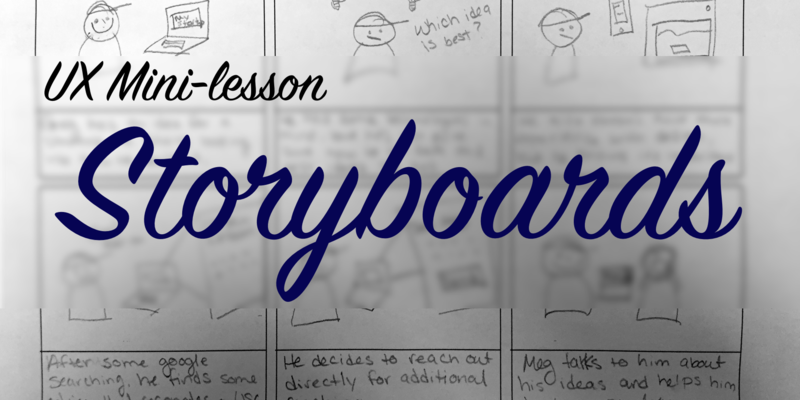 Storyboards can also be used to test out different theories and ideas. Take this example of two storyboards my friend Alysia, the founder of AE Dreams, created. You can see that the storyboards are virtually identical, except one involves the parent playing a game with their child, while the other shows a child playing by themselves. Alysia used these two storyboards to run a series of A/B tests and determine whether parents were more attracted to the idea of being involved in their child’s play, or more attracted to toys children can use on their own. It turns out that virtually all the parents in her study preferred the scenario where they could be a part of the experience. This helped Alysia refine her understanding about what parents really want from a toy. And she was able to validate those ideas before she ever started building an actual product. To help you create your storyboard, I’ve put together this short guide. In the guide there is also a blank template that you can print out and use to start sketching out your storyboard ideas. I hope you find it useful, and I would love to hear any feedback you have! Next PostNext In an MVP, do looks matter?